Scientists and crew aboard CSIRO’s (Commonwealth Scientific and Industrial Research Organisation) Marine National Facility research vessel Investigator circled Heard Island and observed a plume rising from Mawson Peak’s crater and lava flows traveling down the NW flanks during 30-31 January. Visual observations of Heard are very rare due to its remote location. A MODVOLC thermal alert had been issued for 28 January. Remote Heard Island in the southern Indian Ocean is home to the snow-covered Big Ben stratovolcano, which has had confirmed intermittent activity since 1910. The nearest continental landmass, Antarctica, lies over 1,000 km S. Visual confirmation of lava flows on Heard are rare; thermal anomalies and hotspots detected by satellite-based instruments provide the most reliable information about eruptive activity. Thermal alerts reappeared in September 2012 after a four-year hiatus (BGVN 38:01), and have been intermittent since that time. Information comes from instruments on the European Space Agency's (ESA) Sentinel-2 satellite and MODVOLC and MIROVA thermal anomaly data from other satellite instruments. This report reviews evidence for eruptive activity from November 2017 through September 2018. Satellite observations indicated intermittent hot spots at the summit through 12 December 2017. A few observations in January and February 2018 suggested steam plumes at the summit, but no significant thermal activity. An infrared pixel indicative of renewed thermal activity appeared again on 7 March, and similar observations were made at least twice each month in April and May. Activity increased significantly during June and remained elevated through September 2018 with multiple days of hotspot observations in satellite data each of those months, including images that indicated lava flowing in different directions from Mawson Peak. MODVOLC and MIROVA data also indicated increased thermal activity during June-September 2018. Activity during October-December 2017. MIROVA thermal anomalies recorded during October 2017 indicated ongoing thermal activity at Heard (figure 32). This was confirmed by Sentinel-2 satellite imagery that revealed hotpots at the summit on ten different days in October (3, 6, 8, 13, 16, 21, 23, 26, 28, and 31), and included images suggesting lava flows descending from the summit in different directions on different days (figure 33). Figure 32. 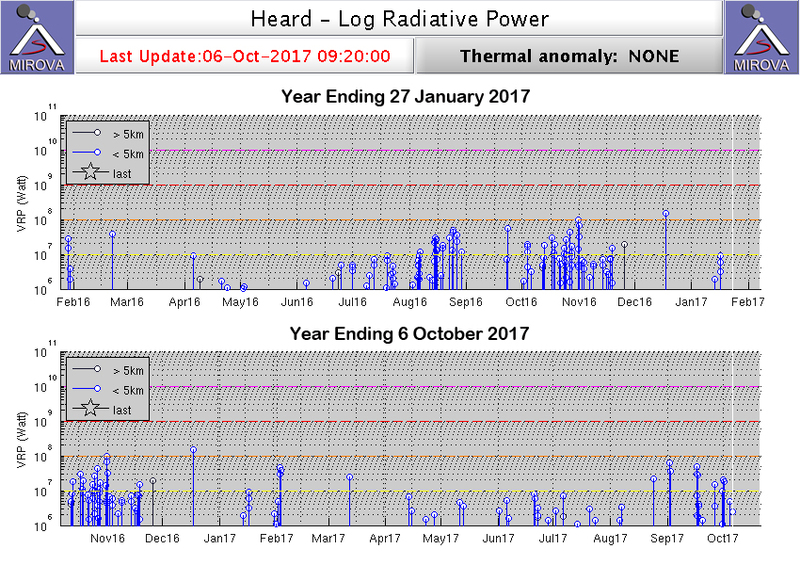 MODVOLC thermal alerts indicated significant thermal activity at Heard during October 2017 that tapered off during November. Intermittent signals appeared in December 2017, March, and April 2018, and a strong signal returned in June 2018 that continued through September. Courtesy of MIROVA. Figure 33. 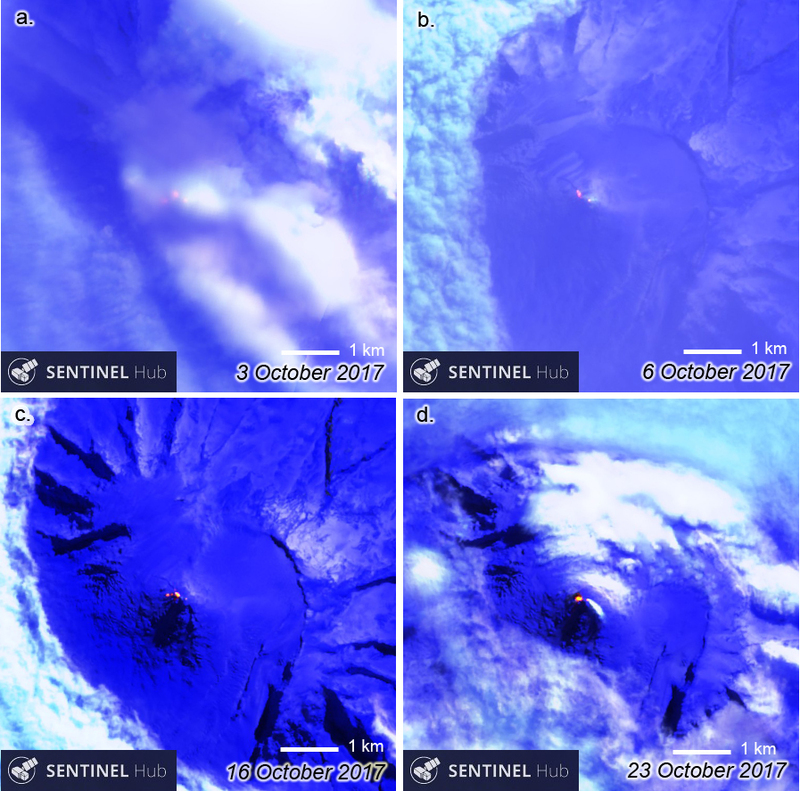 Sentinel-2 images of Heard Island's Big Ben volcano during October 2017 showed strong evidence of active effusive activity. a) 3 October 2017: at least three hot spots were visible through cloud cover at the summit and W of Mawson Peak, suggesting active lava flows. b) 6 October 2017: a small hot spot is visible at the peak with a small steam plume, and a larger hotspot to the NW suggested a still active lava flow. c) 16 October 2017: a small hotspot at the summit and larger hotspots W of the summit were indicative of ongoing flow activity. d) 23 October 2017: a steam plume drifted SE from a small summit hotspot and a larger hotspot to the W suggested a lava lake or active flow. Sentinel-2 images with Atmospheric Penetration view (bands 12, 11, and 8A), courtesy of Sentinel Hub Playground. The MODVOLC thermal alert data showed no further alerts for the year after 22 October 2017, and the MIROVA system anomalies tapered off in mid-November 2017. The Sentinel-2 satellite imagery, however, continued to record intermittent hotspots at and around Mawson Peak, the summit of Big Ben volcano, into December 2017 (figure 34). Hotspots were visible during six days in November (7, 15, 20, 25, 27, and 30) and three days during December (5, 7, and 12). Figure 34. Sentinel-2 images of Heard Island's Big Ben volcano showed reduced but ongoing thermal activity during November and December 2017. a) 7 November 2017: a steam plume drifts NE from a hotspot at Mawson Peak. b and c) 15 November and 12 December 2017: a small hotspot is distinct at the summit. d) 20 December 2017: a steam plume drifts east from the peak, but no clear hotspot is visible. Sentinel-2 images with Atmospheric Penetration view (bands 12, 11, and 8A), courtesy of ESA Sentinel Hub Playground. Activity during January-May 2018. The satellite images during January and February 2018 were indicative of steam plumes at the summit, but distinct thermal signals reappeared on 7 and 12 March 2018 (figure 35). In spite of extensive cloud cover, the Sentinel-2 imagery also captured thermal signals twice each month in April (4 and 14) and May (9 and 14) (figure 36). Figure 35. 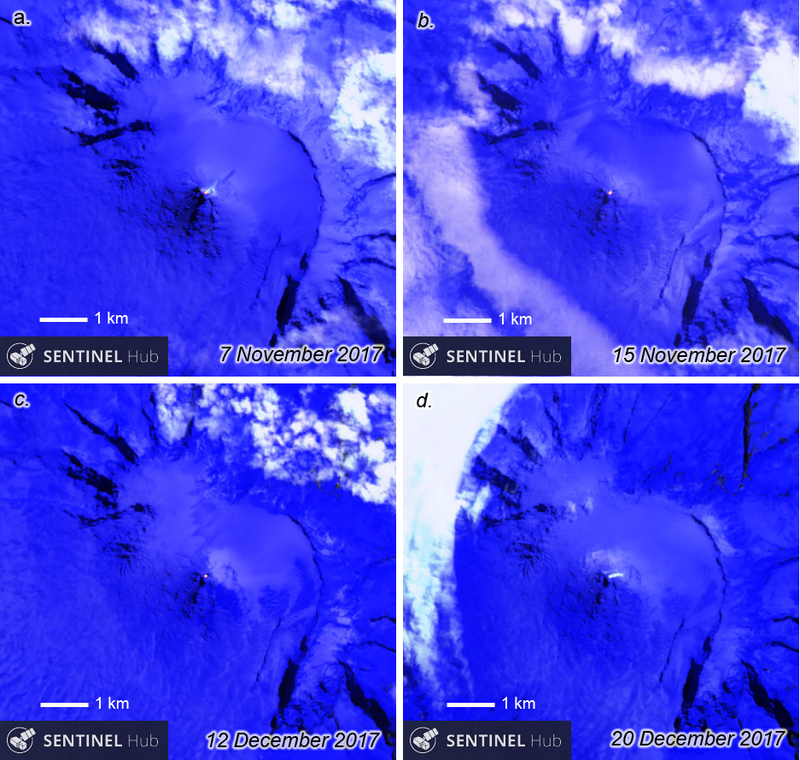 Sentinel-2 images of Heard Island's Big Ben volcano showed only steam plumes at the summit during January and February, but hotspots reappeared in March 2018. a) 4 January 2018: a steam plume drifts SE from the summit under clear skies. b) 8 February 2018: a steam plume drifts SE from the summit adjacent to a large cloud on the N side of the volcano. c) 7 March 2018: the first hotspot in about three months is visible at the summit. d) 12 March 2018: a distinct hotspot is visible at Mawson Peak. Sentinel-2 images with Atmospheric Penetration view (bands 12, 11, and 8A), courtesy of ESA Sentinel Hub Playground. Figure 36. 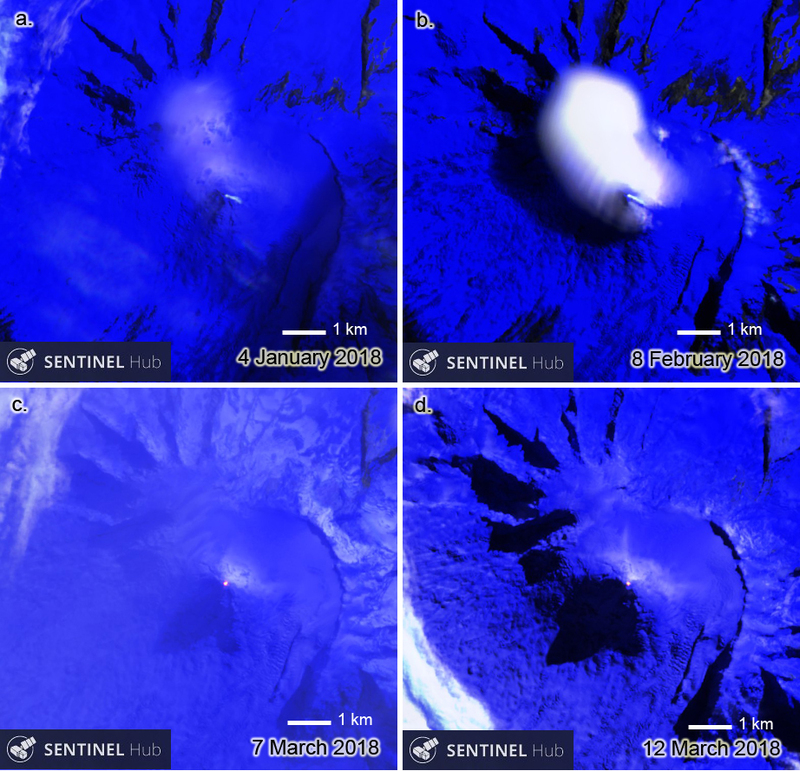 Sentinel-2 images of Heard Island's Big Ben volcano showed intermittent low-level thermal activity during April and May 2018. a) 4 April 2018: a small hotspot is visible at the summit through a hazy atmosphere. b) 9 May 2018: a distinct hotspot glows from the summit beneath cloud cover. Sentinel-2 images with Atmospheric Penetration view(bands 12, 11, and 8A), courtesy of ESA Sentinel Hub Playground. Activity during June-September 2018. Thermal signals increased significantly in the satellite data during June 2018. The sizes of the thermal anomalies were bigger, and they were visible at least nine days of the month (3, 5, 8, 10, 15, 18, 23, 25, and 30). 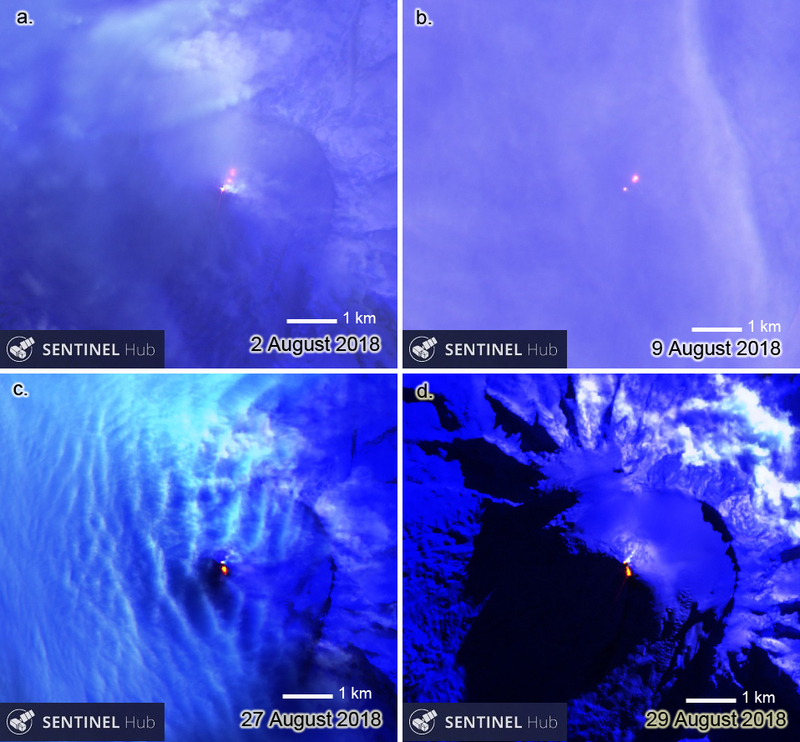 Five substantial thermal signals appeared during July (3, 10, 15, 18, and 28); images on 23 June and 3 July distinctly show a lava flow trending NE from the summit (figure 37). MODVOLC thermal alerts appeared in June 2018 on three days (2, 26, and 27) and on four days during July (7, 8, 9, 10) indicating increased activity during this time. The MIROVA thermal signals also showed a substantial increase in early June that peaked in mid-July and remained steady through September 2018 (figure 32). Figure 37. 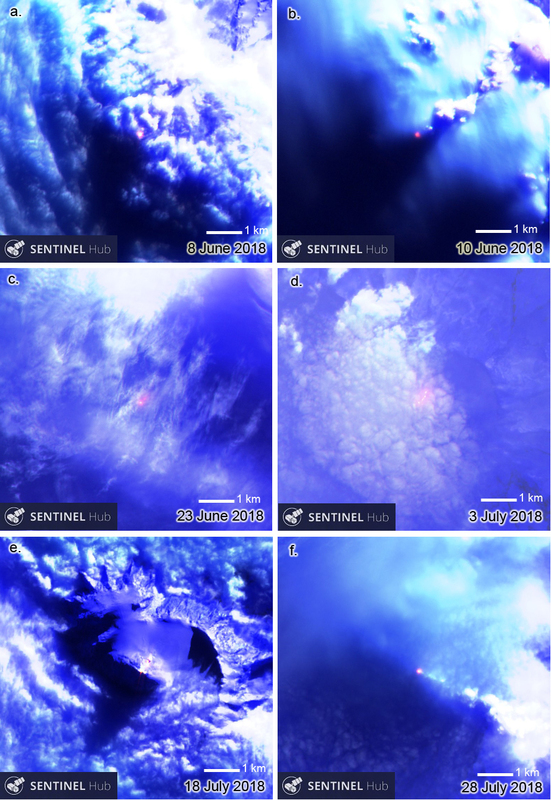 Sentinel-2 images of Heard Island's Big Ben volcano showed significantly increased thermal activity during June and July 2018. a) 8 June 2018: a substantial hotspot is visible through the cloud cover at the summit of Big Ben. b) 10 June 2018: the darker red hotspot at Mawson Peak was significantly larger than it was earlier in the year. c) 23 June 2018: the first multi-point hotspot since 31 October shows a distinct glow trending NE from the summit. d) 3 July 2018: a trail of hotspots defines a lava flow curving NNE from Mawson Peak. e) 18 July 2018: a second significant hotpot is visible a few hundred meters NE of the summit hotspot indicating a still active flow. f) 28 July 2018: the summit hotspot continued to glow brightly at the end of July, but no second hotspot was visible. Sentinel-2 images with Atmospheric Penetration view (bands 12, 11, and 8A), courtesy of ESA Sentinel Hub Playground. Six images in August (2, 7, 9, 22, 27, 29) showed evidence of active lava at the summit, and suggested flows both NE and SE from the summit that were long enough to cause multiple hotspots (figure 38). During September and early October 2018 the satellite images continued to show multiple hotspots that indicated flow activity tens of meters SE from the summit multiple days of each month (figure 39). Figure 38. Sentinel-2 images of Heard Island's Big Ben volcano showed lava flow activity in two different directions from the summit during August 2018. a) 2 August 2018: lava flows NE from Mawson Peak while a steam plume drifts E from the summit. b) 9 August 2018: a second hotspot NE of the summit hotspot indicates continued flow activity in the same area observed on 2 August. c and d) 27 and 29 August 2018: a different secondary hotspot appeared SSE from the summit indicating a distinct flow event from the one recorded earlier in August. Sentinel-2 images with Atmospheric Penetration view (bands 12, 11, and 8A), courtesy of ESA Sentinel Hub Playground. Figure 39. Sentinel-2 images of Heard Island's Big Ben volcano in September and October 2018 showed hotspots indicating active flows SE of the summit on multiple days. a) 3 September 2018: a small hotspot at the summit and a larger hotspot SE of the summit indicated continued flow activity. b) 3 October 2018: a small steam plume drifted east from a small hotspot at the summit and a larger pair of hotspots to the SE indicated continued effusive activity. Sentinel-2 images with Atmospheric Penetration view (bands 12, 11, and 8A), courtesy of ESA Sentinel Hub Playground. Information Contacts: Sentinel Hub Playground (URL: https://www.sentinel-hub.com/explore/sentinel-playground); Hawai'i Institute of Geophysics and Planetology (HIGP) - MODVOLC Thermal Alerts System, School of Ocean and Earth Science and Technology (SOEST), Univ. of Hawai'i, 2525 Correa Road, Honolulu, HI 96822, USA (URL: http://modis.higp.hawaii.edu/); MIROVA (Middle InfraRed Observation of Volcanic Activity), a collaborative project between the Universities of Turin and Florence (Italy) supported by the Centre for Volcanic Risk of the Italian Civil Protection Department (URL: http://www.mirovaweb.it/). A plume from Heard was visible in a satellite image drifting SSW on 30 October. According to a NOAA National Environmental Satellite, Data, and Information Service (NESDIS) scientist, thermal anomalies seemingly on the E flank of Heard were detected in Visible Infrared Imaging Radiometer Suite (VIIRS) satellite images during 2-30 November. Dense cloud cover prevented views of the volcano during 1-2 December. MODIS (Moderate Resolution Imaging Spectroradiometer) images had detected thermal anomalies from September 2014 to 21 July 2014, and again on 16 November 2014, due to a persisting lava lake and possible lava flows. According to NASA Earth Observatory (EO) an image acquired on 7 April from the Advanced Land Imager (ALI) on NASA's EO-1 satellite showed that Mawson's Peak crater on Heard Island had filled and a lava flow had traveled down the SW flank. The lava flow was visible in an image acquired on 20 April and had slightly widened just below the summit. According to Volcano Live, satellite imagery of Heard Island showed thermal anomalies on 21 and 24 September, and 10 and 19 October. NASA's Earth Observatory reported that a satellite image acquired on 13 October showed a possible dark area in the summit crater of Mawson Peak and hot surfaces within the crater, indicating the presence of lava in or just beneath the crater. From 11 March to 2 June, MODVOLC (a MODIS thermal alert system) detected approximately 10 alerts from or near the summit of Big Ben on Heard Island. The area of the thermal anomaly was 1 to 2 pixels in size (1 pixel=1 km). Reports are organized chronologically and indexed below by Month/Year (Publication Volume:Number), and include a one-line summary. Click on the index link or scroll down to read the reports. During the night of 14-15 January, personnel of the French oceanographic mission Sibex (ship) observed an eruption on Heard Island. A lava flow emerged from a vent at ~ 2,750 m altitude, on the upper S flank (between Big Ben and Mawson, figure 1). For 2 days, a plume was visible from 32 km away. An image from the NOAA 7 polar orbiting satellite showed a diffuse plume extending SE from the island on 14 January at 1712. The plume was narrow over the island, widening over the ocean until obscured by weather clouds 20-25 km to the SE. The next day at 1658, NOAA 7 imagery showed that the island was free of weather clouds, but no volcanic plume was evident. Figure 1.Sketch map of Heard Island, from Neumann van Padang (1963). Reference. Neumann van Padang, M., 1963, Catalog of active volcanoes of the world, Part XVI. Information Contacts: J. Bull, Terres Australes et Antarctiques Françaises; A. Giret, Expeditions Polaires Françaises; J-L. Cheminée, IPG, Paris; W. Gould, NOAA. 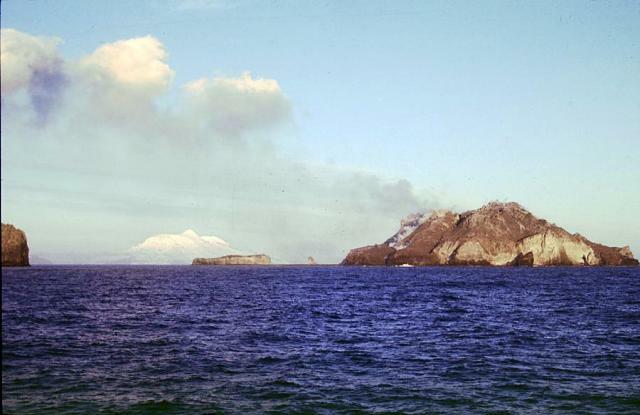 No further reports of volcanic activity on this remote, uninhabited island were received until 29 September, when scientists from the MV Nella Dan (ship) observed steam rising from a vertical crack in the Gotley Glacier (on the SW flank). On 4 October at about 2100, from 11.5 km offshore, two distinct areas of glow were observed: at the summit, and at a point between 1,500 and 2,000 m altitude in Gotley Glacier, 6.5-7 km from the summit. The observers believed the flank glow to be a second source of lava, although they noted the possibility that lava originating at the summit might have flowed under the glacier and emerged at that point. Space Shuttle astronauts observed the volcano emitting vapor every day during their 30 October-5 November mission and took a photograph (no. 61A-49-047), but there was no sign of fresh lava or ash on the summit. Further Reference. Quilty, P., 1985, New volcanic vent on Heard Island? : ANARE News, December. 1985, p. 11. Information Contacts: R. Varne, Univ. of Tasmania; M. Helfert, NASA. [The following from Graeme Wheller] includes observations of continued activity in late 1986 and early 1987, and a renewed eruption in 1992. Volcano morphology. Heard Island consists of two volcanic cones, Big Ben and Mt. Dixon, joined by a narrow isthmus (figure 2). Both cones are young, but only Big Ben has been observed to erupt. Many young lavas, including two that are unvegetated, lie on the flanks of Mt. Dixon. The separation of the two volcanoes is evident from the contrasting petrographic, geochemical, and isotopic characteristics of their respective eruptives [(Barling and others, 1994)]. Figure 2.Geologic sketch map of Heard Island (after Barling, 1990) showing the location of the lava flow observed by Rod Ledingham in mid-January 1993. Big Ben is a large, glacier-covered, composite cone 20-25 km in diameter at sea-level, consisting mainly of basaltic lavas and lesser ash and scoria. Its summit region consists of a SW-facing semi-circular ridge 5-6 km in diameter, 2,200-2,400 m asl. The ridge appears to have formed from breaching of the SW flank of Big Ben, possibly by landsliding caused by seismicity or a laterally directed blast. The E, N, and W flanks of Big Ben have been deeply scoured by glacial erosion, forming high-standing radial ribs to 7-8 km long. Eruptions have built a new regularly shaped cone, Mawson Peak, within the breached region of the summit. Mawson Peak is snow-and ice-covered on all sides, . . . and its SW flank slopes smoothly to the coast. All . . . historical volcanism has apparently originated at the summit of Mawson Peak. Young volcanic deposits. Mt. Dixon, much smaller than Big Ben, appears to be the latest manifestation of volcanic activity that has created a peninsula 9 km long and up to 5 km wide extending from the NW side of Big Ben. Mt. Dixon, at the end of the peninsula, is a glacier-covered rounded cone 706 m tall. More than 20 separate relatively young basaltic lava flows have been identified on its flanks, including two that are largely vegetation-free and may have been erupted within the last few hundred years. These lavas have flowed from vents on the upper flanks of Mt. Dixon, except for one from a fissure marked by an elongate scoria ridge ~1 km long near the base of the S flank. A crater ~50 m in diameter occurs at the head of one W-flank flow ~1 km inland. Several small hornitos occur on the lava flow near this crater. One is still well-formed, ~2.5 m high and 3-4 m in diameter, but the others have largely collapsed. On the W and N flanks of Mt. Dixon, particularly near Red Island, trachytic lavas lie beneath the basalt lavas. Eleven parasitic scoria cones and associated small basaltic lava flows occur around the coastline . . . . Some are at or near the edges of vertical sea cliffs, indicating that erosion by the sea may have obliterated other cones. The parasitic cones are typically ~100 m high and well-formed with deep central craters. Lava spatter usually occurs abundantly around the upper parts of the cones. Lavas produced from these vents are typically small-volume pahoehoe flows. From their morphology and relative lack of vegetation, the cones and their lavas may be only a few thousand years old. On Azorella Peninsula, the parasitic cone forms the W side of Corinth Head which, together with Rogers Head, appears to be a remnant of an older and much larger cone formed of thinly stratified leucocratic tuff. The basaltic flow erupted from the Corinth Head crater contains partly collapsed tumuli and lava tunnels. A similarly youthful, trachytic, airfall (Plinian?) pumice deposit 1-1.5 m thick occurs at the E end of the island. The lower 0.5 m of the deposit is distinctly darker than the upper part, showing a sharp horizontal transition. The deposit is overlain by moraine but underlying material is not visible. Similar deposits are not known from any other parts of the island. Although it is primary deposit and must therefore have been produced by an eruption on Heard Island, the location of its originating vent is not known. December 1986-January 1987 activity. A deep, well-formed crater at the top of Mawson Peak was discovered on helicopter overflights in December 1986 and January 1987, during the 1986/87 Heard Island ANARE. On 21 December, a brief landing was made on the summit beside the crater. The crater was cylindrical and, from visual estimates, ~40-50 m in diameter and 50-70 m deep, with vertical walls exposing dark horizontal ash layers thinly coated in yellow sulfur. The crater was floored by a black ropy lava surface in which small patches of red lava periodically appeared, indicating an active lava lake within the crater. Larger red patches, ~ 5-10 m across, appeared less frequently, accompanied by gentle emissions of a little blue smoke. Minor steam emission also occurred from around the crater rim and from a rocky area on the crater's E side. The crater appears to have been formed by the 1985/87 eruption because it was not seen by climbing parties that reached the summit of Mawson Peak in 1965 and 1983. A new pahoehoe lava flow in a glacial valley on Mawson Peak's SW flank was also discovered during the 1986/87 ANARE. The flow extended ~8-9 km from the summit crater rim, where it exited through a deep V-shaped notch, to within 2-3 km of the coast (near Cape Arkona). Small amounts of steam emanated from parts of the flow, which probably formed in January 1985, as observed from the Marion Dufresne. 1992 summit activity. Satellite images and observations from the ANARE base revealed eruptive activity in 1992. Data from the NOAA 11 polar orbiter showed plumes extending 300 km NNE then E from the island on 17 January at about 1720, and 200 km NE the next day at 0300. Weather in the region is usually cloudy, and no other activity was evident . . . until a short-lived thermal anomaly was detected on 18 May at 2146. The ANARE team had not yet reached Heard Island on 17 January, but the summit area was visible for 20 days in March, 18 days in April, and 7 days in May (as of the 29th). Gas had been emerging from the summit during fieldwork in mid-1990, but no activity was evident in 1992 until 29 May, when an orange glow was first noticed above the mountain at 2130. The glow rapidly intensified and appeared to be pulsating, faded after about a minute, then reappeared a few minutes later. Three or four such cycles were observed, with glow intensity changing randomly. Glow faded for the last time at about 2200. Although some auroral activity occurred that night, none of the observers believed that it was the source of the glow. Activity was next reported on 8 June, when vapor began to emerge from the summit at about 1430, soon forming a plume to the SE. Mist soon obscured the activity. Traces of steam were also visible on 10 June. Reference. Barling, J., 1990, Heard and McDonald Islands, in Le Masurier, W., and Thomson, J., eds., Volcanoes of the Antarctic Plate and southern Oceans: American Geophysical Union, Washington DC, p. 435-441. Further References. Barling, J., Goldstein, S.L., and Nicholls, I.A., 1994, Geochemistry of Heard Island (southern Indian Ocean): characterisation of an enriched mantle component and implications for enrichment of sub-Indian Ocean mantle: Journal of Petrology, v. 35, p. 1017-1053. Hilton, D.R., Barling, J., and Wheller, G.E., 1995, Effect of shallow-level contamination on the helium isotope systematics of ocean-island lavas: Nature, v. 373, p. 330-333. Information Contacts: G. Wheller, CSIRO Division of Exploration Geoscience, Australia; R. Varne, Univ of Tasmania; A. Vrana, K. Green, and T. Jacka, Australian Antarctic Division, Tasmania; W. Gould, NOAA/NESDIS. Evidence of recent eruptive activity was observed by Rod Ledingham, a geologist aboard the cruise ship Kapitan Klebnikov, during a visit . . . in mid-January. Lava had emerged from a new wedge-shaped graben-like feature that extended roughly 150 m down the summit cone's SW flank (figure 2). The flow had divided into two lobes and advanced to below 1,400 m elevation, apparently along approximately the same path taken by the 1985-87 lava. Steam rose from its distal end, but the central part of the flow appeared to be lightly snow-covered. A narrow plume rose from the summit crater, and the area from there E to the caldera wall was covered with gray ash. Vapor was also rising from a fissure roughly 100 m below the summit. 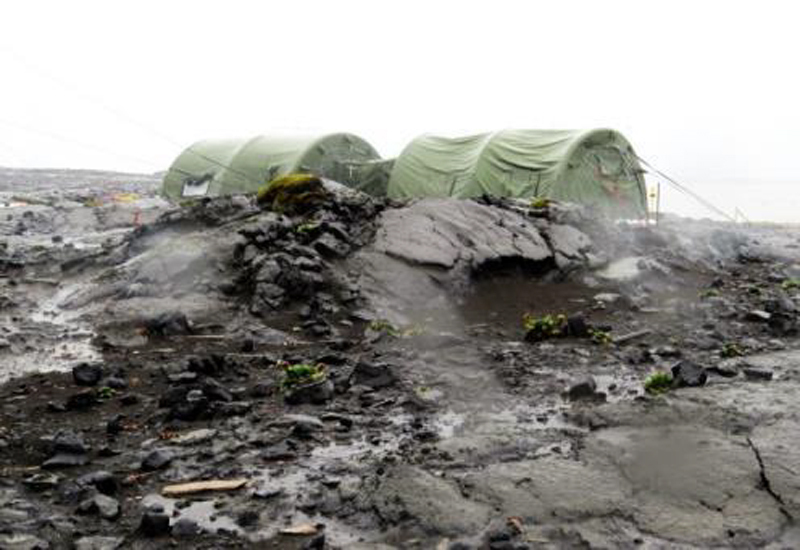 A team of five biologists has been on the island for ~14 months, but weather conditions are poor and the start time of the eruption is uncertain. Attila Vrana, head of the team, reported a strongly felt earthquake on 19 December that was not documented by the Worldwide Standardized Seismic Net. Information Contacts: P. Quilty, Australian Antarctic Division, Tasmania. During 18-21 March geologists sampled Holocene lava flows on Heard Island. On beaches of the N Laurens Peninsula, they found fresh pumice ranging in size up to about 20 x 20 cm . The pumice was concentrated among other storm- transported debris a little distance above the normal surf zone and appeared to have been deposited by wave action. Light creamy green to pale gray in color, the pumice had angular, ovoid or flattened shapes and contained predominantly microphenocrysts and occasional phenocrysts visible to the naked eye. Lithic fragments were not observed. On Heard Island, Big Ben's summit was usually obscured by clouds. The summit was visible on 20 March, however, and at this time no evidence of recent volcanic activity was observed at Mawson Peak, Big Ben's recently active crater (figure 3). Similarly no plume was seen coming from Heard when McDonald vented steam in early April. In accord with these observations, scientists inferred that the December 1996-January 1997 volcanic activity attributed to Heard actually denoted activity at McDonald. Figure 3. Map of Heard Island showing principal volcanic centers on both the Laurens and Azorella Peninsulas (see shaded boxes) and on Big Ben (the massif comprising the bulk of the SE part of the island). The beached pumice samples were collected at the N end of the Laurens Peninsula. Courtesy of K. Collerson. References. LeMasurier, W.E., and Thompson, J.W., primary eds., 1990, Volcanoes of the Antarctic Plate and Southern Oceans, Antarctic Research Series: American Geophysical Union, Washington, D. C. (ISBN 0066-4634). Collerson, K. D., 1997, Field studies at Heard and McDonald Island in March 1997: unpublished Australian National Antarctic Research Expedition (ANARE) report. Information Contacts: Kenneth Collerson, Department of Earth Sciences, University of Queensland, Brisbane, Queensland 4072, Australia; Kevin Kiernan, Department of Geography and Environmental Sciences, University of Newcastle, Newcastle, New South Wales 2300, Australia; Richard Williams, Australian Antarctic Division, Channel Highway, Hobart, Tasmania, Australia; Andrew Tupper, Northern Territory Regional Forecasting Centre, Bureau of Meteorology, P. O. Box 735, Darwin, Northern Territory 0801, Australia. Activity from Mawson Peak, a discrete volcanic cone that lies atop Big Ben stratovolcano, was observed by the Australian National Antarctic Research Expedition (ANARE) during October-November 2000. Frequent cloud cover obscured Big Ben. On 19 October, workers observed several hours of fumarolic activity from the RSV Aurora Australis while 2-3 km off the N shore of Heard Island between Corinthian and Spit Bays. Gaseous emissions were rising at least 200 m above the summit. During the early morning of 20 October, those aboard the ship observed similar continuing activity until clouds obscured the view. 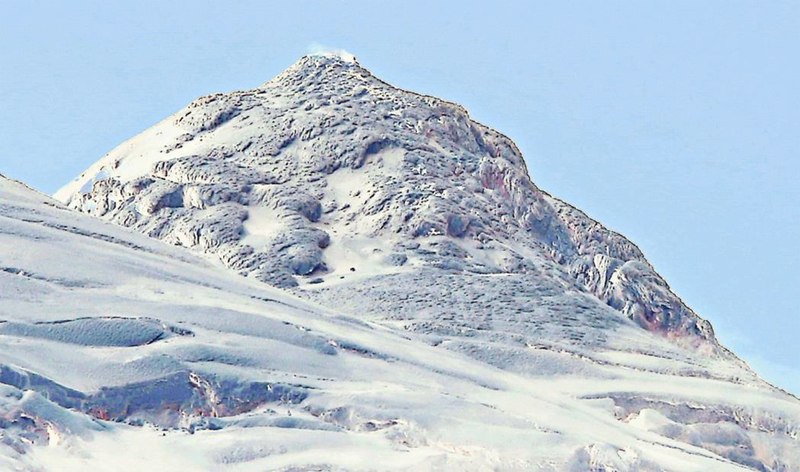 From the Red Island area at the W end of Heard Island, on 28 October strong fumarolic activity was seen emanating from the summit of Mawson Peak. Observers suggested the presence of a second emission point on the S slopes 100-200 m below the summit. On 9 November, a helicopter flyover of Mawson Peak revealed that the crater and lava lake observed in 1987 were no longer visible. Instead, the summit had the form of a steep, irregular ice dome with gases venting through its apex (figure 4). The flyover also confirmed an apparently distinct area of activity 150-200 m below Mawson Peak near the head of Lied Glacier (Kiernan and McConnell, 2000). This newly discovered area was separated from the summit vent by several hundred meters of clean, white ice. Figure 4. Summit of Mawson Peak (Heard Island) discharging gases, viewed from the SW on 9 November 2000. Approximately the top 150 m of the peak can be seen in this view. Photo by Paul Scott, courtesy of Kevin Kiernan. Reports of more than one red glow source from the 1950-52 and 1985 eruptive events hinted at the possible existence of a second vent on Big Ben (ANARE Station Reports, and Neumann van Padang, 1963). Recent failure to locate such a vent led Quilty and Wheller (2000) to conclude that the previously observed multiple red glows were attributable to magma ponded in the summit crater and lava flowing down Big Ben's flanks. Current observations, however, now suggest the presence of a separate, lower vent in the vicinity of the 1985 flow. On 13 November observers from Fairchild Beach on the N coast of Heard Island noted brown fumes venting from the summit area. The following day, fumarolic activity was observed from a vantage point on the E moraine of Browns Glacier Lagoon on the N coast. References. Kiernan, K., and McConnell, A., 2000, ASAC Project 1118, Geomorphological Evolution of Heard Island: Report to Atlas Cove Station Leader, ANARE. Neumann van Padang, M., 1963, Arabia and the Indian Ocean: Catalogue of the Active Volcanoes of the World, v. 16, p. 1-64. Quilty, P.G., and Wheller, G., 2000, Heard Island and the McDonald Islands: A window on the Kerguelen Plateau: Papers & Proceedings of the Royal Society of Tasmania, v. 133, no. 2, p. 1-12. Information Contacts: Kevin Kiernan, Geography and Environmental Studies, University of Tasmania, GPO Box 252-79, Hobart TAS 7001, Australia. Fumarolic activity emanating from Big Ben stratovolcano on Heard Island increased since the previous report period of October-November 2000 (BGVN 25:11). Both the vent at the summit of Mawson Peak and the second, recently confirmed vent downslope from the summit, were involved in the activity in early February 2001. At about 2100 on 2 February an increased emission of volatiles was observed from Atlas Cove, located ~15 km NW of the summit where the main island connects with the Laurens Peninsula (see maps in SEAN 10:02 and BGVN 23:02). Under daylight the plume had a yellow-colored tinge. By midnight venting increased substantially. Observations continued until 0100 on 3 February when emissions appeared to diminish and clouds obscured the view. No lava or ejecta were observed from the Atlas Cove vantage point. The plumes rose up to ~1,000 m in height, but tended to vary in extent over time. The precise points of emission were hidden by the high shoulder of Big Ben. Nevertheless, the emissions appeared to emanate from two discrete vents, one at Mawson Peak, and the other the newly discovered vent estimated to be 300-400 m vertically below it (lower than previously thought) on the S-facing slope. Observations on the afternoon of 3 February revealed further abatement of volatile venting. Some workers suggested the presence of a third vent based on observations from Anzac Peak on Laurens Peninsula at the NW end of the island, but these findings are not yet substantiated. From a high point on Laurens Peninsula a black lava flow (?) on Mawson Peak was observed to be closer to the Atlas Cove side of the island than on previous visits. The possible flow was ~100 m wide and ~1,500 m long, but size estimates were hindered by distance, the enormity of Big Ben, the lack of any comparative scale, and the acute viewing angle. On 5 March observers obtained good views of Big Ben from Red Island, at the farthest N tip of the Laurens Peninsula, but were unable to discern any summit activity despite clear conditions. Further observations from the same vantage point at 1330 on 7 March afforded a brief 5-8 minute view of the summit and revealed that a significant plume rose 100-200 m and drifted several kilometers downwind. The plume's width was estimated to be 50 m. The "black scar" first viewed on 3 February and interpreted as a plausible lava flow was again visible and appeared unchanged since its last observation. The findings in early February and March 2001 are consistent with recent observations during a helicopter overflight of Big Ben that confirmed the presence of a vent well below the summit of Mawson Peak (Kiernan & McConnell, 2000). They compound the likelihood that more than one vent was involved in earlier eruptive activity during 1950-52 and 1985 (ANARE Station Reports; Neumann van Padang, 1963), contrary to recent conclusions by Quilty & Wheller (2000). Observations of volcanism on Heard Island, however, are limited because of its remoteness, and since the summit area is frequently shrouded in clouds. Hence, the general level of activity observed recently is difficult to assess. Information Contacts: Stu Fitch and Andrew Lock, Australian Antarctic Division, Channel Highway, Kingston, TAS 7050, Australia (URL: http://www.antarctica.gov.au/); C.J. Klok, Department of Zoology and Entomology, University of Pretoria, Pretoria 0002, South Africa (URL: http://www.up.ac.za/zoology-entomology/); Kevin Kiernan and Anne McConnell, Geography & Environmental Studies, University of Tasmania, GPO Box 252-79, Hobart TAS 7001, Australia. Photographs taken during early February 2001 at Heard (BGVN 26:02) revealed the character and location of the activity there. Figures 5 and 6 were taken on the early morning of 3 February, shortly after midnight against a dark sky. Light from the active vents illuminated the overcast sky and Big Ben stratovolcano. The two distinct light sources pictured in figure 6 evidenced activity from two separate vents. No research-related visits to the remote Heard Island are planned in the immediate future. Figure 5. View of Big Ben looking SE from Atlas Cove. Copyright Stu Fitch, courtesy of Kevin Kiernan. Figure 6. Telephoto view of Big Ben's upper slopes looking SE from Atlas Cove. Copyright Stu Fitch, courtesy of Kevin Kiernan. Information Contacts: Stu Fitch, Australian Antarctic Division (AAD); Andrew Lock, AAD; C.J. Klok, Department of Zoology and Entomology, University of Pretoria, Pretoria 0002, South Africa; Kevin Kiernan and Anne McConnell, Geography & Environmental Studies, University of Tasmania, GPO Box 252-79, Hobart TAS 7001, Australia. Between 13 May 2000 and 30 January 2003, thermal alerts on Heard Island occurred on the following dates: 24 May; 3, 5, and 6 June; 25 September; 29 October; 5, 15, 19, and 24 November; 16, 17, 26, and 30 December 2000; and 2 February 2001 (figure 7). Since then no further thermal alerts have been recorded. There have been no reports of May-June 2000 activity on Heard Island published in the Bulletin. However, Rothery and Coppola are confident that the MODIS data prove high-temperature volcanic activity at these times. The late-2000 period of MODIS thermal alerts is substantiated by reports from ships and helicopters. The first of these, "fumarolic activity" on 19 October (BGVN 25:11), is 24 days later than the first MODIS thermal alert in this period. A fresh lava flow was suspected but unproven on 3 February (BGVN 26:02), and two incandescent vents were photographed on the same day (BGVN 26:03). The interpretation of the MODIS data is that lava effusion is likely. The locations of the alert pixels (figure 8) suggest that activity was on the WSW side of the summit, and may have extended about halfway to the shore. Figure 7. MODIS detected alerts on Heard during January 2000-March 2001. Courtesy of Diego Coppola and David Rothery, The Open University. Figure 8. Locations of alert-pixels on Heard during 2001-2002. Grid squares are 1 km on a side. Base map from BGVN 17:05 (after Barling, 1990). Courtesy of Diego Coppola and David Rothery, The Open University. Information Contacts: David A. Rothery and Diego Coppola, Department of Earth Sciences, The Open University, Milton Keynes MK 6AA, United Kingdom. Infrared satellite data triggered MODVOLC thermal alerts between 24 May 2000 and 2 February 2001 (BGVN 28:01). A new series of alerts began on 9 June 2003, with frequent alerts continuing until 14 June 2004. The cloud-free ASTER imagery from June 2003 to June 2004 was examined, and although it does not offer very complete coverage of this new phase of activity, all the images contained very small anomalies (just a few pixels) in the central crater. This suggests that most of these alerts are due to increased activity at the lava lake, with no indication of lava flows. Also, all the 2003-2004 MODVOLC anomalies were 1-2 pixels (no elongate thermal anomalies), further suggesting that this is local central-vent activity. Information Contacts: Matt Patrick, Luke Flynn, Harold Garbeil, Andy Harris, Eric Pilger, Glyn Williams-Jones, and Rob Wright, HIGP Thermal Alerts Team, Hawai'i Institute of Geophysics and Planetology (HIGP) / School of Ocean and Earth Science and Technology (SOEST), University of Hawai'i, 2525 Correa Road, Honolulu, HI 96822, USA (URL: http://modis.higp.hawaii.edu/). Matt Patrick observed from MODIS (Moderate Resolution Imaging Spectroradiometer) images analyzed by the HIGP MODVOLC algorithm that relatively new activity began in March 2006 at Heard Island. Two isolated alerts occurred on 11-12 March 2006, and sustained alerts occurred from 7-18 May, 28 May-5 June, and 13-20 June (table 1). Alerts were 1-3 pixels in size. The pixel locations all appeared to be clustered generally near the summit of Big Ben, suggesting central vent (lava lake?) activity rather than lava flows. Advanced Spaceborne Thermal Emission and Reflection Radiometer (ASTER) images over the last several months have all been cloudy and therefore unable to reinforce or support the MODVOLC results. However, a nighttime ASTER image on 29 May 2006 at 0110 showed the new activity (figure 9). Table 1. MODVOLC alerts for 2006 through 21 June. Courtesy of Hawai'i Institute of Geophysical and Planetology (HIGP) Thermal Alerts Team. Figure 9. ASTER image of Heard Island taken at 0110 on 29 May 2006. The main image is the thermal infrared Band 14 (90 m pixel size), with the inserts showing the shortwave infrared (SWIR Band 9; 30 m pixel size) and thermal infrared (TIR Band 14) closeups. This a nighttime image with no visible bands with 15 m pixel size was difficult to interpret. The N-most segment of the summit anomaly, seen clearly in the Band 9 image, may be the vent, with the remainder of the anomaly possibly representing a ~ 900-m-long lava flow to the S. Alternatively, the segmentation of the anomaly may reflect different vents. Courtesy Matt Patrick, HIGP Thermal Alert Team. The previous phases of activity spanned May 2000-February 2001 and June 2003-June 2004 (BGVN 29:12). Information Contacts: Matt Patrick, HIGP Thermal Alerts Team, Hawai'i Institute of Geophysics and Planetology (HIGP) / School of Ocean and Earth Science and Technology (SOEST), University of Hawai'i, 2525 Correa Road, Honolulu, HI 96822, USA (URL: http://modis.higp.hawaii.edu/); Andrew Tupper, Darwin Volcanic Ash Advisory Centre, Bureau of Meteorology, Australia. Matt Patrick reported that Heard Island continued to display evidence of activity in its summit crater (continuing the phase which began in May 2006, BGVN 31:05). Figure 10 presents an ASTER image (Bands 9-3-2) from 8 December 2006 showing a hotspot at the summit, presumably a lava lake, with a recently emplaced lava flow extending 700 m E.
Figure 10. ASTER image (Bands 9-3-2) from 8 December 2006 showing a hotspot at the summit of Heard Island. This is one of the rare daytime ASTER images that shows the summit clearly. Courtesy of Matt Patrick. Table 2 lists the thermal anomalies recorded by the Hawai'i Institute of Geophysics and Planetology (HIGP) during 25 June 2006 (as last reported in the BGVN 31:05) to mid December 2006. The table lists 27 thermal anomalies during 25 June to 15 December 2006. There is no MODVOLC thermal anomaly on 8 December, the date of the ASTER image in the previous figure. Table 2. Thermal anomalies from mid-June to mid-December 2006 from MODIS satellites. Courtesy of HIGP Thermal Alerts Team. Matt Patrick noted that it is not surprising that the ASTER image showed a thermal anomaly but MODVOLC did not. First, because ASTER has infrared bands at 30-90 m, it is inherently more sensitive to thermal anomalies than the 1-km MODIS bands (MODVOLC uses MODIS data). Second, the MODVOLC algorithm has a threshold which sometimes disregards low-level eruptive activity in order to avoid false alarms. The anomaly in the ASTER image was not particularly large or intense, so it is not surprising it did not show up in MODVOLC. Information Contacts: Matthew Patrick, Dept. of Geological and Mining Engineering and Sciences, Michigan Technological University, 1400 Townsend Drive, Houghton, MI 49931, USA; Hawai'i Institute of Geophysics and Planetology (HIGP) Thermal Alerts Team, School of Ocean and Earth Science and Technology (SOEST), Univ. of Hawai'i, 2525 Correa Road, Honolulu, HI 96822, USA (URL: http://modis.higp.hawaii.edu/). An ASTER image over Heard for 29 February 2007 (figure 11) was found by Matt Patrick in which two thermal anomalies are shown, separated by ~ 300 m. The anomaly to the SE appeared to be a new feature, representing either a distinct vent or a hot distal portion of an active flow from the main vent. There are no anomalous shortwave pixels between the two anomalies as one might expect for an active lava surface, but the flow may be channeled underground between the anomalies. The total lack of anomalous pixels in the region between the two anomalies, however, caused Patrick to suspect that this is a distinct vent. If this is a distinct vent, it would be the first clear illustration of multiple vents at Heard. None of the previous images Patrick has studied covering the last 6 years (including the 8 December 2006 image, also using Band 9-3-1 color mapping, shown in figure 12) showed indications of a secondary anomaly. Figure 11. An ASTER Band 9-3-1 RGB composite image of Heard for 29 February 2007, with the shortwave infrared band 9 mapped to red, indicating high temperatures. Two distinct anomalies near the summit of Mawson Peak are shown. The W-most anomaly is at the location of previous anomalies, which appear to be the summit crater (lava lake), while the anomaly 300 m SE is a new feature. Courtesy Matt Patrick. Figure 12. An ASTER Band 9-3-1 RGB composite image of Heard for 8 December 2006, with the shortwave infrared band 9 mapped to red, indicating high temperatures. One distinct anomaly near the summit of Mawson Peak is shown. Courtesy Matt Patrick. MODIS satellite data also revealed thermal anomalies on 24 different days between 27 December 2006 and 6 April 2007 (table 3). Table 3. Thermal anomalies at Heard from mid-December 2006 to early April 2007 from MODIS satellites. Continued from table in BGVN 31:05. Courtesy of Hawai'i Institute of Geophysics and Planetology (HIGP) Hot Spots System. Information Contacts: Hawai'i Institute of Geophysics and Planetology (HIGP) Hot Spots System, University of Hawai'i, 2525 Correa Road, Honolulu, HI 96822, USA (URL: http://modis.higp.hawaii.edu/); Matthew Patrick, Dept. of Geological and Mining Engineering and Sciences, Michigan Technological University, 1400 Townsend Drive, Houghton, MI 49931, USA. Based on Hawai'i Institute of Geophysics and Planetology (HIGP) Thermal Alerts System MODVOLC analysis of MODIS (Moderate Resolution Imaging Spectroradiometer) satellite thermal anomaly data, Matt Patrick reported in June 2007 that the eruption at Heard that started about a year ago (BGVN 31:05, 31:11, and 32:03) seemed to have ceased. Due to its isolated location, Heard Island is rarely visited, and satellite imagery provides the only regular information on eruptive activity. There have been three eruptive periods of 11 months or longer during which thermal anomalies were frequent since MODIS data came online in early 2000 up to 21 July 2007 (table 4). Table 4. Summary of eruptive episodes at Heard based on MODVOLC analyses of MODIS thermal satellite data. Courtesy of Matt Patrick. 2000-2001 07 Mar 2000 02 Feb 2001 332 days 857 days until next eruption. An earlier report (BGVN 28:01) indicated that this eruption began in May 2000, while Patrick's data indicated that MODIS thermal alerts began in March 2000. 2003-2004 09 Jun 2003 14 Jun 2004 371 days 635 days until next eruption. A graph prepared by Patrick and the HIGP Thermal Alert System Team (figure 13) showing radiant heat output and distance of alert pixels from the volcano vent (1 pixel=1 km) also shows the three separate eruptions since 2000. Pixel distances determined from Advanced Spaceborne Thermal Emission and Reflection Radiometer (ASTER) data and the MODVOLC alert show that activity during all three eruptions was centered around the summit crater, with sporadic lava flows during the 2000-2001 and 2006-2007 episodes. Only the 2000-2001 eruption clearly featured long (i.e. several kilometer long) lava flows, as shown by the > 3 km distance in July 2000 (figure 13). Patrick noted that a 2-km-long lava flow seen in Landsat imagery early in the 2000 eruption, on 7 July 2000 (figure 14), was detected by MODVOLC on 10 July 2000. However, since the location of the MODVOLC alerts from that time period were not far from the source vent, the alerts were not effective for showing the length of the lava flow. Figure 13. MODVOLC data for Heard showing radiant heat output (top) and distance of alert pixels from the vent (bottom), January 2000-21 July 2007. Courtesy of Matt Patrick. Figure 14. Landsat image showing active flow at Heard Island, 7 July 2000. Courtesy of Matt Patrick. The 2003-2004 and 2006-2007 activity appeared to be largely limited to the summit crater, as indicated by the small MODVOLC distances (i.e. 1 km or less, with 1 km being the size of the pixels and inherent uncertainty) and ASTER data examined. ASTER data did show a possible 900-m-long flow to the SW of the vent in May 2006 (BGVN 31:05 and 31:11) and a clear 700-m-long flow of lava extending NE of the summit crater in December 2006, indicating that small effusive events have occurred in addition to central vent activity in the 2006-2007 phase. Patrick has not observed to this time any obvious ash plumes in the ASTER images, but all of the images examined appeared to be partly cloudy. Patrick noted that it is difficult to determine exactly how often thermal anomalies for Heard Island may be completely obscured by clouds. The benefit of MODIS is the 1-2 observations per day, so that if activity is indeed present, it should not elude detection for very long. In the MODVOLC plot (figure 13), there were fairly regular alerts over the course of a year or so at a time, during which there must have been some cloud cover. Information Contacts: Matt Patrick, Dept. of Geological and Mining Engineering and Sciences, Michigan Technological University, 1400 Townsend Drive, Houghton, MI 49931, USA; Hawai'i Institute of Geophysics and Planetology (HIGP) Thermal Alerts System, School of Ocean and Earth Science and Technology (SOEST), Univ. of Hawai'i, 2525 Correa Road, Honolulu, HI 96822, USA (URL: http://modis.higp.hawaii.edu/); NASA Earth Observatory (URL: http://earthobservatory.nasa.gov/NaturalHazards/). Due to its isolated location in the S Indian Ocean on the Kerguelen Plateau, Heard Island is rarely visited, and satellite imagery provides the only regular information on eruptive activity. The Hawai'i Institute of Geophysics and Planetology (HIGP) Thermal Alerts System MODVOLC provides an analysis of MODIS (Moderate Resolution Imaging Spectroradiometer) satellite thermal anomaly data, with 1-2 daily observations. That system remains the best source of evidence at isolated, glacier-covered volcanoes like Heard, though it is difficult to determine how often meteorological clouds may obscure thermal anomalies. The last report summarized activity beginning in March 2000 (BGVN 32:06), describing three eruptive episodes (based on thermal anomalies). The last thermal anomaly mentioned was on 6 April 2007. As seen on table 5, the MODVOLC system recorded the next thermal anomaly on 24 July 2007. For the rest of 2007, there were anomalies recorded on two days in August and two days in November. During 2008 as late as 2 March, anomalies occurred in February and March. Table 5. Thermal anomalies measured by MODIS/MODVOLC over Heard Island during 7 April 2007 through 2 March 2008. Courtesy of HIGP Thermal Anomalies Team. Information Contacts: Hawai'i Institute of Geophysics and Planetology (HIGP) Thermal Alerts System, School of Ocean and Earth Science and Technology (SOEST), Univ. of Hawai'i, 2525 Correa Road, Honolulu, HI 96822, USA (URL: http://modis.higp.hawaii.edu/). According to Matt Patrick (USGS) in a report dated 25 October 2010, satellite imagery has not detected unambiguous eruptive activity at Heard since March 2008. No MODVOLC thermal anomalies have been detected since that time, and recent cloud-free ASTER images generally lacked indications of eruptive activity. Given Heard's isolation, satellite imagery provides the only regular information on its behavior. As previously reported, numerous anomalies had been noted in 2006 and 2007, clearly indicating eruptions (BGVN 31:05, 31:11, 32:03, and 32:06). Rare thermal anomalies were recorded through 2 March 2008, with sufficient radiance and extent to suggest eruptions (BGVN 33:01). Patrick found recent ASTER images that include faint thermal anomalies. The anomalies appeared at Big Ben volcano's Mawson Peak, which is both the volcano's and the island's summit, and hosts the active vent. The most recent cloud-free image, taken on 25 February 2010 (figure 15), shows a small (2-3 pixels in size) thermal anomaly, indicating either very low-level activity or simply warm ground in and around the vent. Figure 15. ASTER image of Heard on 25 February 2010, showing a thermal anomaly (image based on Aster band 14, 11-micron wavelength). Courtesy of Matt Patrick (USGS) and the ASTER project. Information Contacts: Matthew R. Patrick, Hawaiian Volcano Observatory (HVO), U.S. Geological Survey, PO Box 51, Hawai'i National Park, HI 96718, USA (URL: https://volcanoes.usgs.gov/observatories/hvo/); Hawai'i Institute of Geophysics and Planetology (HIGP) Thermal Alerts System, School of Ocean and Earth Science and Technology (SOEST), Univ. of Hawai'i, 2525 Correa Road, Honolulu, HI 96822, USA (URL: http://modis.higp.hawaii.edu/); ASTER (Advanced Spaceborne Thermal Emission and Reflection Radiometer), Earth Remote Sensing Data Analysis Center (ERSDAC) in Japan, and the Jet Propulsion Laboratory in the U.S. (URL: http://asterweb.jpl.nasa.gov/). We received an informal report from Matt Patrick (Hawaiian Volcano Observatory) on a new eruptive episode at Big Ben volcano, Heard Island (figure 16). He noted that MODVOLC thermal alerts reappeared at Heard in September 2012 after a four year hiatus (the last eruptive episode ended on 2 March 2008; BGVN 33:01), suggesting the start of a new eruptive episode at the volcano. Since Heard Island is unsettled and extremely isolated, monitoring of the volcano is possibly primarily through satellite imagery (Patrick, 2013). Figure 16. A contour map (interval = 200 m) showing the partly ice-covered Heard Island. At the time of map preparation, the brown areas were ice free. Produced and issued in January 2000 by the Australian Antarctic Data Centre, Department of the Environment and Heritage, Commonwealth of Australia. EO-1 Advanced Land Imager images collected through late 2012 and early 2013 confirm that eruptive activity resumed around September 2012, in the form of a low-level effusive style eruption similar to its other recent eruptions (figures 17 and 18). Patrick noted that the vent crater had enlarged significantly over the four years following the end of the last eruptive phase, March 2006-March 2008. Figure 17. A series of images documenting the summit crater and subsequent lava advances at Mawson Peak, Heard Island from 3 July 2012 to 5 January 2013. The Earth Observing-1 (EO-1) satellite's Advanced Land Imager (ALI) Band 1 (panchromatic) images (10-m-pixel size) acquired several clear images on 3 July, 9 September, 13 October, 15 and 28 December 2012, and 5 January 2013. North is to the top of the photos. In the first three images the 200-m diameter crater at the summit of Mawson Peak is easily visible, and there is no evidence of activity outside of the crater. Courtesy of Matt Patrick. Figure 18. EO-1 ALI Band 10-3-2 RGB composites (30-m-pixel size) of the same series of images as in figure 17 (3 July 2012 to 5 January 2013). North is to the top of the photos. The red is the shortwave infrared band (Band 10, 2 microns); red pixels indicate high temperatures suggesting hot lava surfaces. As in figure 17, the 3 July 2012 image shows that the summit crater was cold, with no evidence of lava inside. 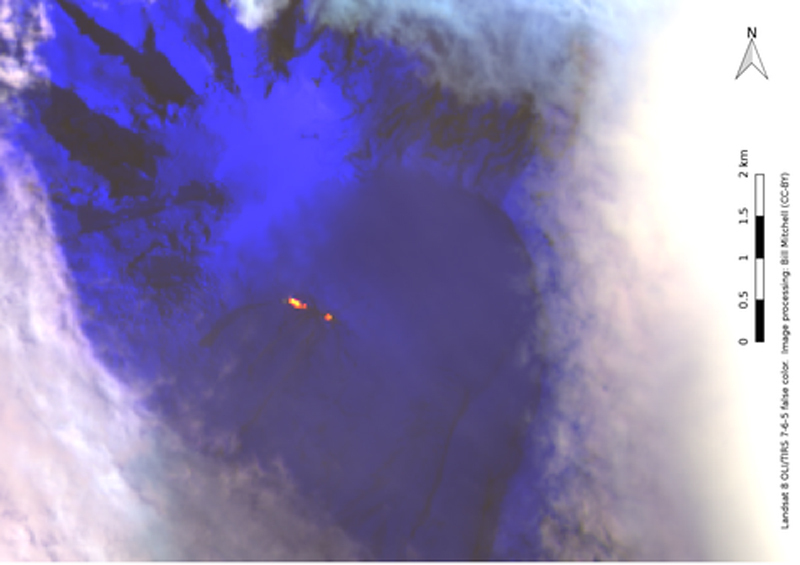 However, the 9 September 2012 image clearly shows that elevated temperatures (and presumably lava) had appeared in the crater, consistent with the appearance of MODVOLC thermal alerts later that month. Therefore, this eruptive episode appears to have started around September. Courtesy of Matt Patrick. The 15 December 2012 image in figure 17 shows that a short lava flow from the summit was emplaced on the SW flank. The flow was ~420 m long and had two lobes. By 28 December, a flow consisting of two lobes (presumably the same flow as in the 15 December image) had reached 770 m SW of the summit crater. In the 5 January 2013 image this flow was 780 m long and had changed little over the previous week. Figure 18 shows that the 9 September and 13 October 2012 images suggested active lava contained with the summit crater. The 15 and 28 December 2012 images showed elevated temperatures on the lava flow SW of the summit, suggesting it was active over this interval, which was consistent with the observed elongation of the flow in the visible images. Fewer high-temperature pixels in the 5 January 2013 image and the meager advancement observed in the visible images, suggested that the flow had stalled by this point. Overall, the activity as of mid-March 2013 had consisted of lava within the crater and a lava flow of at least 770 m long emplaced SW of the crater. This low-level effusive activity is consistent with the previous three eruptive episodes observed in satellite images at Heard Island (Patrick and Smellie, in review). These three episodes, May 2000-November 2001 (BGVN 25:11, 26:02, 26:03, and 28:01), June 2003-July 2004 (BGVN 29:12), and March 2006-March 2008 (BGVN 31:05, 31:11, 32:03, 32:06, 33:01, and 35:09), each lasted 1-2 years. On this basis, Patrick suggested that this new eruptive episode may persist for a similar duration. MODVOLC thermal alerts were measured nearly continuously from 21 September 2012 through 24 February 2013. References. Patrick, M., 2013, A new eruptive episode at Big Ben Volcano, Heard Island, informal communication to BGVN, 23 February 2013. Patrick, M.R., and Smellie, J.L., in review, A spaceborne inventory of volcanic activity in Antarctica and southern oceans, 2000-2010, Antarctic Science, in review in 2013. Information Contacts: Matt Patrick, Hawaiian Volcano Observatory (HVO), U.S. Geological Survey, PO Box 51, Hawai'i National Park, HI 96718, USA (URL: https://volcanoes.usgs.gov/observatories/hvo/); Australian Antarctic Data Centre, Department of the Environment and Heritage, Commonwealth of Australia (URL: https://data.aad.gov.au/database/mapcat/heard/heard_island.gif); MODVOLC, Hawai'i Institute of Geophysics and Planetology (HIGP) Thermal Alerts System, School of Ocean and Earth Science and Technology (SOEST), Univ. of Hawai'i, 2525 Correa Road, Honolulu, HI 96822, USA (URL: http://modis.higp.hawaii.edu/). In BGVN 38:01 we reported information from Matt Patrick of the Hawaiian Volcano Observatory (HVO) on the onset of thermal alerts measured by satellites for Heard Island (see map, fig. 16, in BGVN 38:01) in September 2012 after a 4-yr hiatus. MODIS/MODVOLC measured thermal alerts fairly regularly from 21 September 2012 through 6 October 2013, with the greatest number of days showing measured thermal alerts in December 2012 and March 2013. In a satellite image acquired by NASA Earth Observatory on 13 October 2012 (figure 19), Heard Island is covered in pristine snow and glacial ice. Mawson Peak appears quiet. However, reports by the web site for Volcano Live and heat signatures detected by a satellite suggest recent activity at the volcano. Figure 19. Although not definitive, this natural-color satellite image taken 13 October 2012 suggests an ongoing eruption. The dark summit crater—much darker than Mawson's shaded SW face—is at least partially snow-free. There is also a faint hint of an even darker area—perhaps a lava flow—within. Shortwave infrared data shows hot surfaces within the crater, indicating the presence of lava in or just beneath the crater. Heavy cloud cover camouflaged what may have been a plume that erupted less than an hour after the image above was captured. Because the volcano is located on the inaccessible Heard Island, 2,000 km N of Antarctica and 2,700 km SE of Africa, satellites are the primary means of monitoring Mawson Peak. Image and information courtesy of Robert Simmon, NASA Earth Observatory, using data from Advanced Land Imager (ALI) aboard the Earth Observing-1 (EO-1) satellite. By 7 April 2013, Mawson's steep-walled summit crater had filled, and a trickle of lava had spilled down the volcano's SW flank (figure 20). On 20 April (figure 21), the lava flow remained visible, and had even widened slightly just below the summit. Figure 20. Natural-color satellite image of Heard Island acquired 7 April 2013 by the EO-1 ALI. Image courtesy of Jesse Allen and Robert Simmon, NASA Earth Observatory, using data from Advanced Land Imager (ALI) aboard the Earth Observing-1 (EO-1) satellite; information courtesy of Robert Simmon. Figure 21. Satellite image of Heard Island acquired on 13 October 2012 by the Advanced Land Imager (ALI) aboard the Earth Observing-1 (EO-1) satellite. When compared with an image taken 7 April 2013 (figure 20), it appears that the lava flow is widening at the volcano's caldera; the caldera appears to have filled with so much lava that some has cascaded down Mawson Peak. Image courtesy of Jesse Allen and Robert Simmon, NASA Earth Observatory, using data from Advanced Land Imager (ALI) aboard the Earth Observing-1 (EO-1) satellite; information courtesy of Robert Simmon. Satellite inventory, 2000-2010. Patrick and Smellie (2013) recently published an article on a 10-yr (2000-2010) spaceborne inventory of volcanic activity in Antarctica and southern oceans, including Heard Island. They noted that MODVOLC alerts indicated that eruptive activity at Heard Island comprised three sustained episodes during the decade; 24 May 2000-2 February 2001, 9 June 2003-June 2004, and 11 March 2006-2 March 2008. "Throughout the first two eruptions and their subsequent repose intervals, the summit vent was small, and less than 100 m wide ... At some time in 2008 or early 2009 ... the summit crater widened to 200 m." Also, the authors noted that "the activity at Heard Island was entirely effusive and there is no evidence for any low-level explosive activity" during the study decade. The article notes that a limiting factor for satellite monitoring in this region is persistent cloud cover, although tall volcanoes such as Big Ben on Heard Island often have their summits above the cloud cover, resulting in "a higher rate of cloud-free views." Reference. Patrick, M.R., and Smellie, J.L., 2013, Synthesis: A spaceborne inventory of volcanic activity in Antarctica and southern oceans, 2000-10, Antactic Science, v. 25, no. 4, p. 475-500, doi:10.1017/S0954102013000436. Information Contacts: Matt Patrick, Hawaiian Volcano Observatory (HVO), U.S. Geological Survey, PO Box 51, Hawai'i National Park, HI 96718, USA (URL: https://volcanoes.usgs.gov/observatories/hvo/); NASA Earth Observatory (URL: http://earthobservatory.nasa.gov/); MODIS/MODVOLC, Hawai'i Institute of Geophysics and Planetology (HIGP), MODVOLC Thermal Alerts System, School of Ocean and Earth Science and Technology (SOEST), Univ. of Hawai'i, 2525 Correa Road, Honolulu, HI 96822, USA (URL: http://modis.higp.hawaii.edu/); and Volcano Live (URL: http://www.volcanolive.com). Thermal activity detected by MODIS (Moderate Resolution Imaging Spectroradiometer) recorded by the MODVOLC system occurred regularly from 21 September 2012 through 6 October 2013 (BGVN 38:08). This report covers thermal alerts and anomalies from the remainder of 2013 through March 2016, and describes the observations of two plumes, one by satellite image on 30 October 2015, and the other by scientists aboard a research vessel during 30-31 January 2016. Thermal anomalies continued to be seen in MODIS data between October 2013 and 21 July 2014, and again on 16 November 2014, due to a persistent lava lake and possible lava flows. According to a NOAA National Environmental Satellite, Data, and Information Service (NESDIS) scientist, thermal anomalies seemingly on the E flank were detected in Visible Infrared Imaging Radiometer Suite (VIIRS) satellite images during 2-30 November 2014. Dense cloud cover prevented views during 1-2 December. The frequency of MODVOLC alerts decreased in 2015, with the exception of frequent alerts during June and July 2015, with a single alert on 31 December. In early 2016 there were alerts measured on 28 January and 21 February. A plume from Heard was visible in a U.S. Air Force satellite image drifting SSW on 30 October 2015. Data provided by Middle InfraRed Observation of Volcanic Activity (MIROVA) show frequent moderate thermal anomalies that tapered off after September 2015. MIROVA data also show that the frequent anomalies occurred farther from the summit during the early to mid-portion of 2015 (figure 22). Figure 22. MIROVA graphs showing thermal anomalies at Heard 2 April 2015 to 1 April 2016. The log radiative power (bottom) indicates moderate thermal energy at distances (top) of generally 1-2.5 km from the summit. Recorded anomalies tapered off starting in early August 2015, with a few seen again in late January and February 2016. Courtesy of MIROVA. During 30-31 January 2016, scientists and crew aboard CSIRO's (Commonwealth Scientific and Industrial Research Organisation) Marine National Facility research vessel Investigator circled the island and observed a plume rising from Mawson Peak's crater and lava flows traveling down the NW flanks (figure 23). Visual observations are very rare due to its remote location. A MODVOLC thermal alert on 28 January was likely due to the lava emissions. Figure 23. Small ash plume rising from Big Ben on Heard Island, 30-31 January 2016. On the flank at left in this view, the gray material is lava, from which steam is rising due to interaction with the snow and ice; a video taken at the same time shows the lava moving. Photo by Pete Harmsen; courtesy of CSIRO. Information Contacts: Marine National Facility, Commonwealth Scientific and Industrial Research Organisation (CSIRO), Hobart, Tasmania, Australia (URL: http://mnf.csiro.au/, https://blog.csiro.au/big-ben-erupts/); Michael J. Pavolonis, NOAA/NESDIS Center for Satellite Applications and Research (STAR), Advanced Satellite Products Branch (ASPB), Madison, Wisconsin, USA (URL: https://www.star.nesdis.noaa.gov/star/aspb_index.php); Hawai'i Institute of Geophysics and Planetology (HIGP), MODVOLC Thermal Alerts System, School of Ocean and Earth Science and Technology (SOEST), Univ. of Hawai'i, 2525 Correa Road, Honolulu, HI 96822, USA (URL: http://modis.higp.hawaii.edu/, http://modis.higp.hawaii.edu/cgi-bin/modisnew.cgi); MIROVA (Middle InfraRed Observation of Volcanic Activity), a collaborative project between the Universities of Turin and Florence (Italy) supported by the Centre for Volcanic Risk of the Italian Civil Protection Department (URL: http://www.mirovaweb.it/); United States Air Force, 557th Weather Wing, Weather Intel Flight, 2 WS/WXI Offutt AFB, NE 68133, USA. The remote island of Heard in the southern Indian Ocean is home to the Big Ben stratovolcano, which has had confirmed intermittent activity since 1910. The nearest continental landmass, Antarctica, lies over 1,000 km S. Visual confirmation of lava flows on Heard are rare; thermal anomalies detected by satellite-based instruments provide the most reliable information about eruptive activity. Thermal alerts reappeared in September 2012 after a four-year hiatus (BGVN 38:01), and have been intermittent since that time. Information comes primarily from MODVOLC and MIROVA thermal anomaly data, but Australia's Commonwealth Scientific and Industrial Research Organisation (CSIRO) also provides reports from research expeditions. The independent March-April 2016 Cordell Expedition also provided recent ground-based observations mentioned in this report, which covers activity through September 2017. Expeditions during January-April 2016. Scientists aboard the CSIRO Research Vessel Investigator observed an eruption of Big Ben on 31 January 2016. 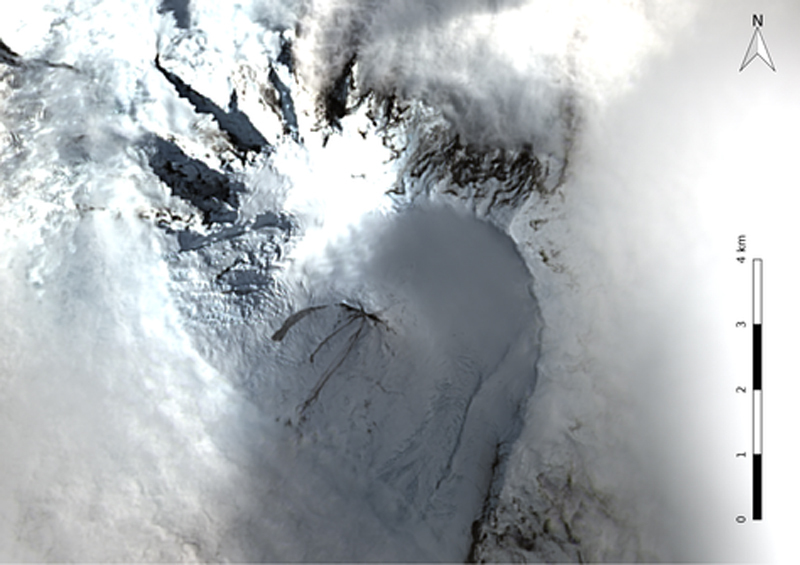 Vapor was seen emanating from the peak and lava flowed down the flank over a glacier (see figure 23, BGVN 41:08, and video link in Information Contacts). The research team, lead by the University of Tasmania's Institute for Marine and Antarctic Studies (IMAS), was conducting a study of the link between active volcanoes on the seafloor and the mobilization of iron by hydrothermal systems which enriches and supports life in the Southern Ocean. During a private expedition from 22 March to 11 April 2016, scientists and engineers from the 2016 Cordell Expedition documented changes to the island and its life since a prior visit in 1997, and tested radio operations. On 23 March the team was able to photograph the usually cloud-covered Mawson Peak, the summit of Big Ben (figure 24). Steam was visible above the flat upper surface, possibly a crater rim or fissure. They estimated a height of about 45 m of an edifice rising above the adjacent slope. The ground at the site of the team campsite, near Atlas Cove on the NW side of the island, was covered with lava flows (figure 25). While the expedition had to cancel a planned expedition to the summit, rocks collected from the shoreline confirmed the diversity of volcanic rocks on the island (figure 26). Figure 24. Mawson Peak is the summit of Big Ben volcano on Heard Island in the southern Indian Ocean. This photograph, taken on 23 March 2016 from Altas Cove on the NW side of the island by the 2016 Cordell Expedition, shows steam from a possible crater or vent area at the summit, and lava flows covered with a dusting of snow around the otherwise glacier-covered peak. Courtesy of Robert W. Schmieder, 2016 Cordell Expedition, used with permission. Figure 25. Lava flows cover the ground near the 2016 Cordell Expedition campsite at Atlas Cove on the NW side of Heard Island in March 2016. Courtesy of Robert W. Schmieder, 2016 Cordell Expedition, used with permission. Figure 26. Rock samples collected at Heard by the 2016 Cordell Expedition during 23 March-11 April 2016 attest to the volcanic activity of the island. 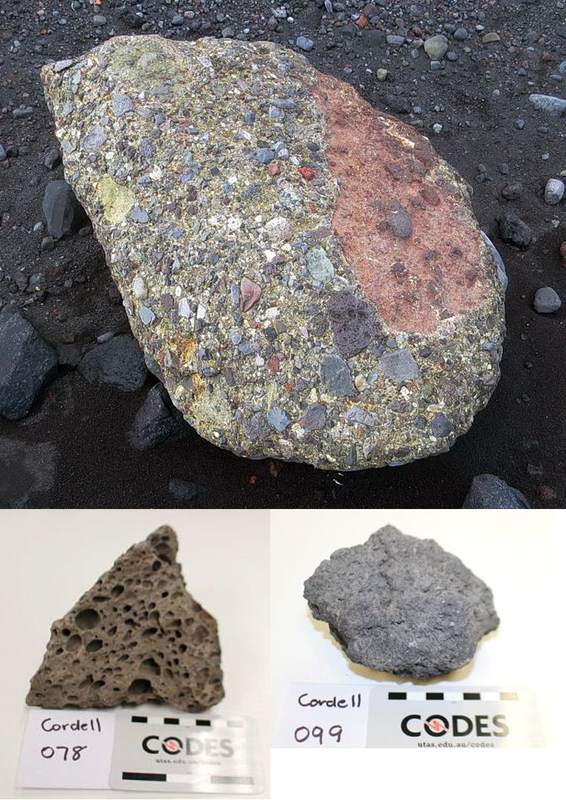 Top: A conglomerate sampled from the east shore of Stephenson Lagoon with mostly volcanic rock fragments, including vesicular basalt (dark brown, lower center) and clasts of volcanic breccia containing fragments of lava (large clast on right side). Sample is about 25 cm long. Bottom: A variety of textures was typical in the volcanic rocks collected on the islands. Courtesy of Robert W. Schmieder, 2016 Cordell Expedition, used with permission. At the southern end of Sydney Cove, near Magnet Point on the northern tip of Laurens Peninsula (the NW side of the island), the team identified a small islet, with dimensions of about 40 x 120 m and nearly vertical sides about 100 m high. Columnar jointing in the volcanic rocks is well exposed at the base and on the nearly flat upper surface (figure 27). Figure 27. Distinctive columnar jointing in the volcanic rocks is visible around the base and on the top of a small islet in Sydney Cove off the NW end of Heard Island in this image taken during the 23 March-11 April 2016 Cordell Expedition. Courtesy of Robert W. Schmieder, 2016 Cordell Expedition, used with permission. Satellite thermal and visual data, 2012-2017. The most consistent source of information about eruptive activity at Heard comes from satellite instruments in the form of visual and thermal imagery, and thermal anomaly detection. From the time that renewed activity was detected in MODVOLC data in late September 2012 through September 2017, either the MODVOLC or MIROVA systems have consistently detected thermal signals, with only a few short breaks. A four-month span from mid-July to mid-November 2014, and a two-month gap during February and March 2015 are the only periods longer than a month when no thermal signal was reported. Continuous MIROVA information from late January 2016 through September 2017 shows intermittent but persistent thermal anomalies throughout the period (figure 28). Figure 28. A continuous MIROVA signal from 27 January 2016 through 6 October 2017 shows persistent low-level thermal activity through the period with intervals of increased activity during late January 2016, July-August 2016, late September-November 2016, early February 2017, and September 2017. Courtesy of MIROVA. The moderate signal at the very end of January 2016 coincides with the CSIRO expedition observing the lava flows on the flank of Big Ben. Low-level MIROVA anomalies were recorded in April and early May 2016. Activity picked up during June, and strengthened through July and August 2016. Late September through November 2016 was a period with heightened activity as well. From December 2016 through August 2017, intermittent low-to-moderate intensity anomalies were recorded every month. Activity appeared to increase briefly during early February and September 2017. On 4 February 2017, Landsat 8 captured a rare clear view that showed fresh lava and debris flows emanating from the summit on top of the snow (figure 29). The longest flow is estimated to be 1,300 m long. False-color infrared imagery of the same image of Mawson Peak also reveals two vents separated by about 250 m (figure 30). Subsequent imagery on 20 and 27 February also detected thermal anomalies at the summit. The visual imagery of the lava flows on 4 February 2017 corresponds to the early February spike in MIROVA thermal anomaly data. Figure 29. Lava and debris flows radiate away from Mawson Peak on Heard Island in this Landsat 8 OLI image captured on 4 February 2017. MIROVA thermal anomaly data show a spike in activity at the same time. Courtesy of NASA and Bill Mitchell (CC-BY). Figure 30. False-color infrared imagery of Mawson Peak, Heard Island, 4 February 2017. Two vents are visible in red-yellow, separated by about 250 m. Data source: Landsat 8 OLI/TIRS bands 7-6-5. Image courtesy of Bill Mitchell (CC-BY), data from NASA/USGS. Information Contacts: Commonwealth Scientific and Industrial Research Organisation (CSIRO) (URL: http://www.csiro.au/); CSIROscope, CSIRO Blog, Big Ben Erupts: Australia's active volcano cluster blows its lid (URL: https://blog.csiro.au/big-ben-erupts/); Robert W. Schmieder, 2016 Cordell Expedition, 4295 Walnut Blvd., Walnut Creek, CA 94596, Post Expedition report to the Australian Antarctic Division (AAD) (URL: http://www.cordell.org/, http://www.heardisland.org/); MIROVA (Middle InfraRed Observation of Volcanic Activity), a collaborative project between the Universities of Turin and Florence (Italy) supported by the Centre for Volcanic Risk of the Italian Civil Protection Department (URL: http://www.mirovaweb.it/); Hawai'i Institute of Geophysics and Planetology (HIGP) - MODVOLC Thermal Alerts System, School of Ocean and Earth Science and Technology (SOEST), Univ. of Hawai'i, 2525 Correa Road, Honolulu, HI 96822, USA (URL: http://modis.higp.hawaii.edu/); NASA Earth Observatory, EOS Project Science Office, NASA Goddard Space Flight Center, Goddard, Maryland, USA (URL: http://earthobservatory.nasa.gov/); Bill Mitchell, The Inquisitive Rockhopper, Big Ben eruption update 2017-02-27 (URL: https://inquisitiverockhopper.wordpress.com/2017/02/). The most recent eruptive period at Heard began in September 2012 (BGVN 38:01). Direct observations are rare at this remote volcano, but the presence of lava flows can frequently be discerned using infrared satellite data. Thermal anomalies were intermittent, with some episodes of clearly stronger activity, during 2016 and through September 2017 (BGVN 42:10). During all of 2017, MODIS infrared satellite data analyzed using the MODVOLC algorithm showed anomalies near the summit only on 2, 16, and 26 September, and on 1 and 22 October. The MIROVA system also detected numerous hotspots within 5 km of the volcano through late October. One additional significant anomaly was identified on approximately 12 November 2017 (figure 31). No further significant anomalies were noted through February 2018. Figure 31. Low to moderate power thermal anomalies in MODIS data were identified by the MIROVA system in September and October, with another on approximately 12 November 2017. Courtesy of MIROVA. Information Contacts: MIROVA (Middle InfraRed Observation of Volcanic Activity), a collaborative project between the Universities of Turin and Florence (Italy) supported by the Centre for Volcanic Risk of the Italian Civil Protection Department (URL: http://www.mirovaweb.it/); Hawai'i Institute of Geophysics and Planetology (HIGP) - MODVOLC Thermal Alerts System, School of Ocean and Earth Science and Technology (SOEST), Univ. of Hawai'i, 2525 Correa Road, Honolulu, HI 96822, USA (URL: http://modis.higp.hawaii.edu/). Heard Island on the Kerguelen Plateau in the southern Indian Ocean consists primarily of the emergent portion of two volcanic structures. The large glacier-covered composite basaltic-to-trachytic cone of Big Ben comprises most of the island, and the smaller Mt. Dixon volcano lies at the NW tip of the island across a narrow isthmus. Little is known about the structure of Big Ben volcano because of its extensive ice cover. 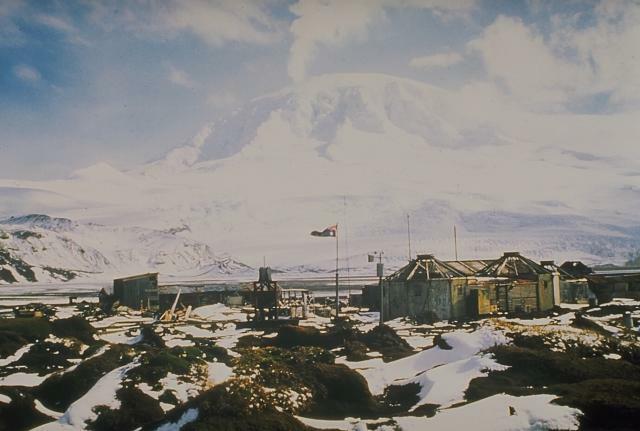 The historically active Mawson Peak forms the island's 2745-m high point and lies within a 5-6 km wide caldera breached to the SW side of Big Ben. Small satellitic scoria cones are mostly located on the northern coast. Several subglacial eruptions have been reported in historical time at this isolated volcano, but observations are infrequent and additional activity may have occurred. This volcano is located within the Heard and McDonald Islands, a UNESCO World Heritage property. Barling J, Goldstein S L, Nicholls I A, 1994. Geochemistry of Heard Island (Southern Indian Ocean): Characterization of an enriched mantle component and implications for enrichment of the sub-Indian Ocean mantle. J Petr, 35: 1017-1053. LeMasurier W E, Thomson J W (eds), 1990. Volcanoes of the Antarctic Plate and Southern Oceans. Washington, D C: Amer Geophys Union, 487 p.
Neumann van Padang M, 1963. Arabia and the Indian Ocean. Catalog of Active Volcanoes of the World and Solfatara Fields, Rome: IAVCEI, 16: 1-64. Wheller G, 1989. (pers. comm.). There is data available for 13 Holocene eruptive periods. There is no Deformation History data available for Heard. There is data available for 1 emission periods. Expand each entry for additional details. A steam plume rises in 1985 or 1986 from the summit of Big Ben volcano on Heard Island in the southern Indian Ocean. It is seen here from an abandoned Australian geophysical station at Atlas Cove, NNW of the summit. The historically active Mawson Peak forms the island's 2745-m high point and lies within a 5-6 km wide caldera breached to the SW side of Big Ben. Small satellitic scoria cones are mostly located on the northern coast. Several subglacial eruptions have been reported in historical time at this isolated volcano. Photo by A. Hitchman, 1985 (courtesy of Wally Johnson, Australian BMRGG, Canberra). 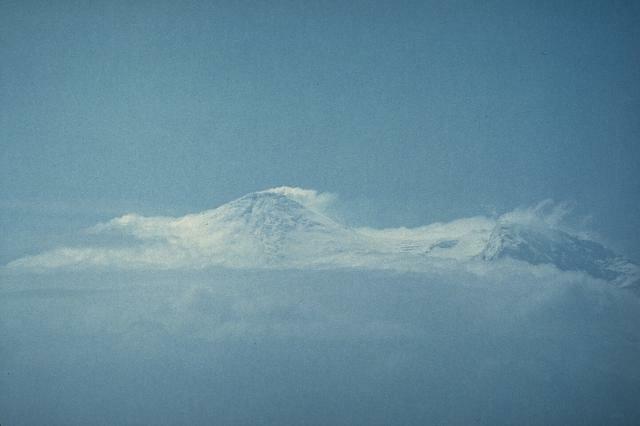 A steam plume, seen here from a ship to the SW, drifts from the summit of Heard volcano on January 14, 1985. Red glow and a lava flow was observed that night from the ship 25 km offshore and an eruption plume was visible for two days. Eruptive activity may have continued into 1987 at this isolated volcano. An active lava lake in a new cylindrical crater was observed by a December 1986-January 1987 summit expedition. A lava flow, probably dating back to January 1985, was seen descending 8-9 km from the summit. Photo by André Giret, Expéditions Polaires Françaises, 1985. Three small, low islands on the Kerguelen Plateau form the McDonald Islands. The largest island, McDonald, is only 1 sq km in area and 186 m high. This April 1997 photo shows steam venting at Samarang Hill (right). 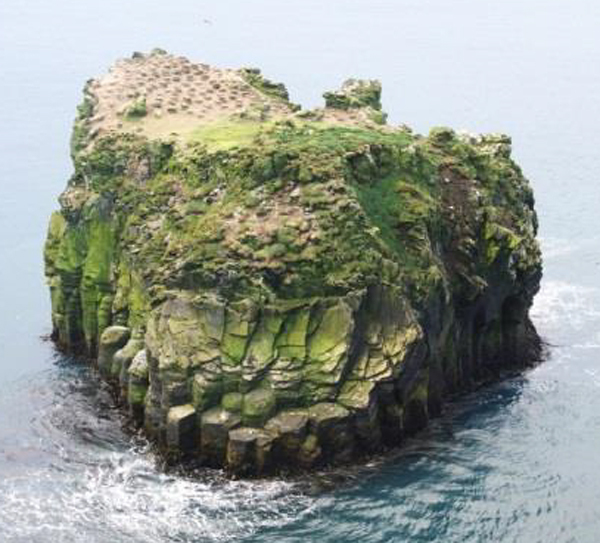 McDonald Island is composed of a layered phonolitic tuff plateau cut by phonolitic dikes and lava domes. A possible nearby active submarine center was inferred from phonolitic pumice that washed up on Heard Island in 1992. The snow-capped peak in the background is Heard volcano, 44 km to the east. Copyrighted photo by Richard Williams, 1997 (Australian Antarctic Div., published in Global Volcanism Network Bulletin). The Global Volcanism Program has no maps available for Heard. There are no samples for Heard in the Smithsonian's NMNH Department of Mineral Sciences Rock and Ore collection. Large Eruptions of Heard Information about large Quaternary eruptions (VEI >= 4) is cataloged in the Large Magnitude Explosive Volcanic Eruptions (LaMEVE) database of the Volcano Global Risk Identification and Analysis Project (VOGRIPA).